Since 1991, bass legend Ron Carter has had a very fruitful relationship with Somethin' Else. 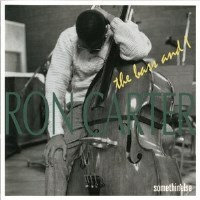 For the sixth album for the label, Carter decided to go back to Rudy Van Gelder's studio where he'd had numerous sessions for such historic labels as Blue Note and Prestige. Leading his regular group at the time (Stephen Scott on piano, Lewis Nash on drums and Steve Kroon on percussion), he also decided to do a "live recording" without an audience. The result is a very nice album consisting of well-executed standards and three attractive Carter originals. The atmosphere is relaxed and spontaneous but everyone is deeply focused. The group is very tight and musical ideas are executed with a keen attention to detail. Recorded at the Rudy Van Gelder Studio, New Jersey on January 14, 1997. SHM-CD uses an advanced polycarbonate material for superior sound quality and is compatible with all CD players.